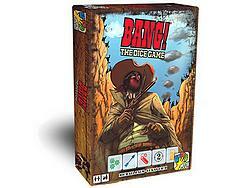 All the excitement of BANG!, now with dice! In the Wild West, the eternal battle between the Law and the Outlaws keeps heating up. Suddenly, a rain of arrows darkens the sky: it's an Indian attack! Are you bold enough to keep up with the Indians? Do you have the courage to challenge your fate? Can you expose and defeat the ruthless gunmen around you?